Important medical information and life-saving techniques are now available at the press of a button. Apple and other cell-phone manufacturers are developing programs and applications for use on mobile devices that will contain all of the owner’s medical information, including allergies, pre-existing conditions and the medications the patient is currently taking. This information can be vital in an emergency and may mean the difference between life and death for some. While medical alert bracelets are still in use, the bracelets cannot hold much information and the engraving may wear off. The cell phone applications can be edited, manipulated and amended as the owner’s condition changes. Should the owner become hurt or sick, the needed information can be accessed by first responders and doctors to provide correct and targeted c are. Spouse, children and other family members’ medical information can be inputted and saved into the application for convenient retrieval when needed. Doctor, network, clinic and insurance information can be stored in the database and searched for on-the-go facility information. 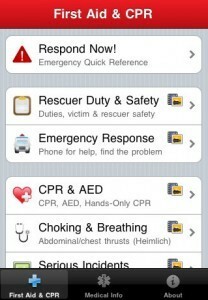 In addition, first aid and CPR applications and programs are also being developed. These applications provide step-by-step instructions on triage methods, such as splinting a broken bone, applying a tourniquet, staunching blood flow and stabilizing a neck injury. The application also provides illustrated examples on the proper administration of cardiac pulmonary resuscitation or CPR, as well as defibrillation. Other first aid care articles and videos include rescue breathing (mouth-to-mouth), choking, pest and animal bites, burns, diabetic emergencies, strokes, seizures and lacerations. For IPhone and IPod touch users, the articles, videos and illustrations are saved directly to your device memory for access outside cell phone range. The American Heart Association also provides real-time information about emergency situations and disasters in your area. 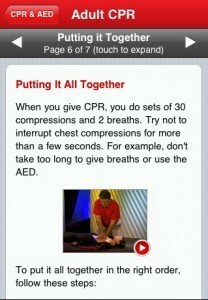 It will also provide streaming updates of any changes in first-aid or CPR care to keep your device current.